Above: Cardiff's great keep rests majestically on its medieval motte. 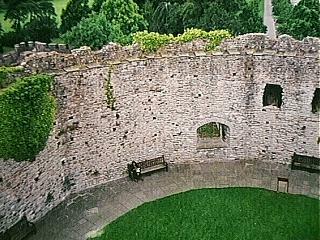 Right: an interior view of Cardiff's great keep from above. t first glance, Cardiff's city center seems an unlikely place to find a castle. The capitol of Wales is a typical city, busy, laden with traffic, shoppers searching for a good buy. Government buildings glisten in the sun. The National Museum of Wales offers impressive exhibits of Welsh history and cultural development. However, in the midst of this urbanization, Cardiff's ancient past is grandly displayed, in the form of a fine castle. Some individuals scoff at Cardiff's castle, claiming it is not a true castle, that it is of too recent construction to be taken seriously. These people are woefully misguided, for Cardiff Castle is indeed an authentic castle. It is actually the combined work of more than one building period, the masonry remains of which are clearly visible in the structure. One's initial impression of the castle is sudden, based upon Victorian-age renovations. Hallmarked by the ornate Clock Tower, splendid in its own right but oftentimes downplayed as unauthentic, the exterior of the castle has been greatly redesigned to fit the fantasies of two remarkable 19th century medievalists: the 3rd Marquess of Bute, John Patrick Crichton-Stuart, and his whimsical architect, William Burges. Both men were highly talented dreamers who sought to recreate their visions of the Middle Ages in their own lifetimes, here in Cardiff, and also at the fanciful Castell Coch, an enchanting reconstruction not too far outside of Cardiff (and also open to the public). The marvelous Clock Tower with its colorful artwork, contrasts dramatically with earlier stonework at the castle. Inside and out, the Victorian additions startle and dazzle. Over and over, throughout the castle, the 19th century interiors are decorated with such flamboyance and gaudy embellishment that the original features of the castle are greatly overshadowed, almost to the point of complete invisibility. Astrological symbols, nature's creatures, the pleasures of the seasons, biblical characters dressed in gilt robes, moorish designs, and heraldic features are some of the themes that run rampant throughout Bute's castle. Flowing fountains, rich greenery and incredible marble fireplaces accentuate the astounding effect of their creators' medievalist yearnings. Unfortunately, many visitors come away from Cardiff Castle blinded with the grandeur (or they may consider it the tackiness) of Lord Bute's masterpiece. They fail to realize that Cardiff Castle is so much more than a monument to two men's idealization of the long lost past. It is the keeper of a profoundly impressive relic from the Norman past, one that has persisted despite changes in taste and the impact of modernization and urban development; and, it also houses remnants from an even earlier social order: the Roman era in Wales. Most likely, the Romans built earliest settlement at Cardiff in the mid-first century AD. A site of great strategic value along the extensive network of Roman roads in Wales, Cardiff sat along the main link between Caerleon (with its wonderful, virtually intact, amphitheater) and Carmarthen (where another, less well- preserved, amphitheater was built). The Romans constructed a 10- acre fort on the spot where the castle now rests. Inside the walls would have been barracks, workshops, stores and other essential buildings. Apparently, three successive forts were erected by the Romans during their tenure at Cardiff. However, it was not until Lord Bute's building program in the late 1800's that any Roman ruins were uncovered. Much of what does remain from the Roman period is now clearly visible as you approach the main entrance into the castle, at the base of the later Norman walls, separated from later stonework by a narrow layer of red sandstone. Right: Inside the great keep at Cardiff Castle. Note the remains of a fireplace on the right, and a stairway leading to the top of the keep at left. While some of the Roman masonry endured until the Norman Invasion of the 11th century, it was quickly incorporated into a typically Norman fortress. Indeed, Cardiff's authentic castle is of Norman origins. It is an outstanding example of the classic motte and bailey fortification. Passing through the gatehouse, you are immediately seized by the vision of the motte as it surges upwards from the lush green bailey directly across from the gateway. And, its crowning glory is the remarkably intact shell keep. With the bulky motte and its surrounding water-filled ditch, the marvelous keep gives the visitor a perfect image of the true Norman castle. The first Norman castle was built on the site in about 1091, by Robert Fitzhamon, Lord of Gloucester and one of the Conqueror's favored followers, an earth and timber fortification, merely a mound and bailey. The motte, erected over a rocky hillock, was some 40 feet tall, and would have been protected by a timber palisade. During the 12th century, the castle's lord, Robert "the Consul" (the natural son of King Henry I), realized the defensive value of reinforcing his fortress with stone and ordered the construction of the shell keep. The 12-sided keep survives in fine condition, the only significant additions being its 15th century gatehouse and the stairway breaching the sloping motte. For a time, the keep was the prison of Robert, 2nd Duke of Normandy (and also FitzRoy uncle), on the command of FitzRoy father, the king. Much of Cardiff Castle's history revolves around conflicts with the native populace. 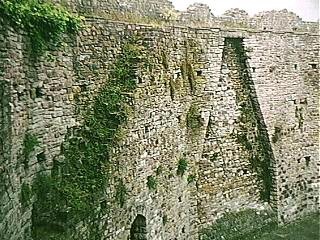 In 1183-84 the Welsh revolted, and caused much damage to the castle and its associated town. Even though the powerful de Clare family took hold of the castle (as well as numerous other estates) in the following century, problems persisted with Welsh insurgency. In the 1270's, when Wales was unified under the leadership of the charismatic Welshman, Llywelyn ap Gruffydd (the Last), Gilbert de Clare refortified the castle in anticipation of further Welsh rebellion. The curtain wall was strengthened and construction of the Black Tower and south gateway was initiated. The much awaited assault never occurred and de Clare's work remains in solid repair to this day. Right: another view from inside the keep. In 1306, the castle passed to Britain's notorious Despenser family and remained their possession for almost 100 years. Conflict (and not just with the Welsh) was the Despenser strong point. In 1317, Llywelyn Bren was imprisoned at Cardiff Castle after instigating a revolt against the English overlords. There, he "suffered a traitor's death in direct violation of the weak king's command, with his body being dragged through the streets", a despicable act so typical of the Despensers. In 1321, the Despenser castle at Cardiff was besieged and captured by neighboring marcher lords who sought to overthrow their pathetic king, Edward II. A vocal supporter of the king, Hugh le Despenser was assessed as an interloper with unfair access to the monarchy. In 1326, the marcher lords attained their goal: Edward II was imprisoned (and brutally murdered the following year), and Hugh le Despenser was hanged at Hereford. During the infamous rebellions of Owain Glyndwr in the earliest years of the 15th century, the Welsh avenged the murder of Llywelyn Bren, savagely assaulting Cardiff Castle and setting the town on fire. However, the Despensers retained control of the castle until 1414, when the rights to Cardiff's castle passed to the husband of the last Despenser heir, Isabel. Passing shortly thereafter to the widowed Isabel's second husband, the castle became the possession of another influential family, the Beauchamps, earls of Warwick. 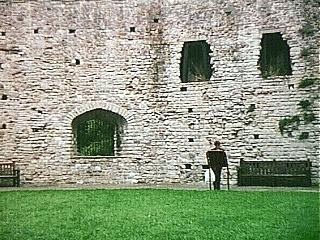 Richard Beauchamp was responsible for the construction of new buildings at Cardiff Castle, including residential quarters along the western curtain wall and the impressive Octagon Tower. As tutor to the infant king Henry VI, Richard Beauchamp travelled with his charge to France, and died there in 1445. 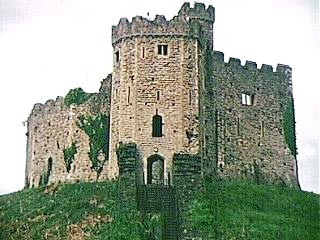 Richard's daughter, Ann, received Cardiff Castle as part of her inheritance, and her husband, Richard Neville, became its new lord. Neville later became known as "Warwick, the King-Maker" for his extreme influence in the affairs of State. After the King-maker's death in 1471, the fortress at Cardiff passed first to his eldest daughter, another Isabel, and then to her sister, Ann (whose husband, Richard, Duke of Gloucester, became King Richard III in 1483). 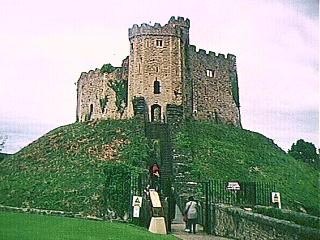 Upon King Richard's defeat by Henry VII, founder of the formidable Tudor dynasty, Cardiff Castle was granted to the new king's well-respected uncle, Jasper. With the exception of a brief time when Ann Beauchamp regained possession of the castle, it belonged to the monarchy for the next 75 years. In 1550, William Herbert, member of one of Britain's most powerful medieval families (and brother of Henry VIII's last wife, Catherine Parr), obtained control of Cardiff Castle, which he embellished to some degree. During the English Civil War the Herberts sided with their king, Charles I, offering him refuge at the castle in the summer of 1645. Cardiff Castle was a prize sought by both sides of the struggle, the Royalists and Parliamentary forces, but it was eventually taken by Oliver Cromwell's army. Interestingly, despite sustaining some damage during the Civil Wars, Cardiff Castle was essentially ignored by Cromwell, who ordered the "slighting" of so many other Welsh castles in 1649. In fact, the Herberts were able to make necessary repairs to the castle and kept it in running order well into the following century. However, after the Civil War, the Herberts began spending more and more time away from their castle in Cardiff, and, in 1776, the last Herbert heir, Charlotte Jane, passed the estates to her husband John Stuart, soon to become the Earl of Bute. The Butes were to have incredible impact on the development of Cardiff into the city we see today. Extensive modifications were made to the castle's interiors by various Bute earls, and the famous landscape artist "Capability" Brown was brought in to recreate the grounds. Fortunately, the Norman fortress remained little altered, although for a time the ditch was infilled with earth. The castle's ultimate fate was left to the whimsy of the 3rd Marquess of Bute, who assumed the title in 1848 and began the castle's rebirth in 1865. In 1947, Cardiff Castle was turned over to the care and trust of the people of the city, and Cardiff City Council maintains the site in outstanding condition. The castle, including its ornate interiors and enchanting Norman fortress, is open to the public, for a fee, on most days. It is a remarkable tribute to all the individuals who lived and dreamed inside its walls.